Gregg Fraley is the author of Jack’s Notebook. Greg works as an innovation consultant to Fortune 500 companies and does keynote speeches and workshops on creative thinking, innovation, problem solving, and new product development. Q: What is CPS and where can we use it? 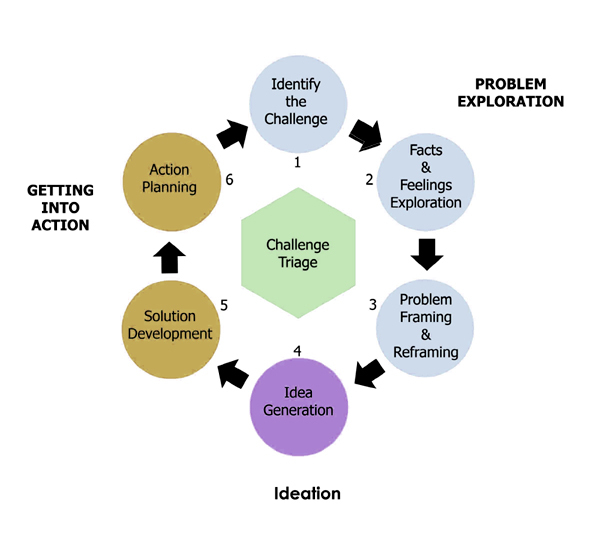 Gregg: CPS is a problem solving methodology and it can be used to help develop solutions for any complex challenge, problem, situation, or opportunity. If you’re hunting for your car keys you probably don’t want CPS, it’s too much! If you’re trying to sort out how your brand fits in the marketplace and what do next year, CPS is an appropriate system. Q: You shared with me a story about the origins of CPS. Would you mind sharing that story with my readers? Q: What is the most common mistake you see by those engaged in the creative problem solving process? Gregg: Well, the most common mistake is not using a process at all. When faced with complexity the brain tends to spin or churn from one thought to another related to the problem. We tend not to write things down and so we muddle about in confusion. The value of a structured process like CPS is it helps us sort it out. Sort out what we want, what the facts and feelings are, what the challenge really is, and what are our options for moving forward. It helps us push beyond the obvious and find breakthrough solutions. If you are already using the CPS process the answer would be not allowing enough time. A common mistake in problem solving is rushing to a solution. Taking time allows the mind time to incubate the question at hand. Time tends to lend insight and insight leads to more creative solutions. Q: What’s the significance of lists? Gregg: List making, particularly when it is done without judgment, is the easiest way to get into imaginative mode. The mind seems to like the incremental aspect of list making, and, it tends to give us what we want, which is more options. List making is divergence and in general we need more divergence in our thinking. Critique and analysis are overemphasized in our education and training, and divergence is left behind. List making is a great way to re-balance things. Q: Could you give us some tips on making great lists? Gregg: First of all, write them down (it’s not called Jack’s Notebook for nothing!). Mental lists tend to get lost in the shuffle of the 65,000 thoughts we have a day. Next, know what the questions is, what you are seeking options for, be clear about that. Most of all, defer judgment and let any option that pops into your head get onto the list, don’t edit. Sometimes silly, impractical, or wild ideas are the steps the mind needs to take in order to get to a Perfect idea. Finally, when blocked put your list aside and take a short vacation from the challenge, give it some time, then come back to it. New options will emerge. Q: I noticed that the characters in your story seemed to always engage in CPS when they were in small groups of no more than 4 people. Was this just a happenstance, or is there a maximum number for people working together through CPS? Gregg: Happenstance! There is no minimum or maximum, CPS can be done alone, or, with large groups. I did a session a few months ago for a cosmetics company that included over 70 people and three languages. The groups in Jack’s Notebook just happened to be about that size of four or less because it’s what the story called for. I’ve found that groups of 15 or less are optimal for corporate ideation. Larger than that it becomes a logistics challenge, smaller, and you don’t have a lot of thinking diversity. It can still be done you work with what you have. Q: You seemed to put a lot of emphasis on the correct phrasing of questions. Why? Gregg: Well, that’s part of the structure behind creative problem solving. Words are what we have to work with in problem solving. Words point the brain in different directions depending on how a question is phrased. For instance when you have a challenge you could say, How did this project become so expensive? That kind of question leads one to think about the past, and it invites critique. Saying it as a solvable problem takes us down a different path, so In what ways might I reduce the costs of the project? has us thinking about ideas, about options, that bring the cost down. Phrases like In what ways might I, or How might I are empowering and provide a subtle bit of hope. They challenge the brain to come up with answers that are useful, and, the brain tends to respond well to that. Q: Many companies are quick to start planning, but are very slow to act. Often times plans never make it any farther than the board room or company retreat. Why? Gregg: There are a lot of reasons, but that most basic one is the person or team empowered to execute the plan isn’t motivated to change. In my opinion, and it’s unfortunate, many organizations aren’t motivated to make a change unless there is an emergency that demands it. Board rooms and retreat situations often get people thinking, and that’s good, but they tend to use the critical/analytical side of the brain too much and so the plans they generate are often all head and no heart. If you don’t have the heart to do something it simply won’t happen. Q: What should they do instead? Gregg: It should be less of a one meeting thing and more of an all the time way of being. Innovation is holistic it’s not doing an activity, it’s being, living, breathing, eating, and waking-up-in-the morning in innovative mode. An organization needs a deliberate and formal holistic system, like CPS, to enable consistent innovation. Adopting a particular tool, technique, or hiring a dynamic and charismatic leader isn’t going to get it for you. What will get it for you is a holistic approach that blends many complex elements into a gestalt that is greater than the sum of its parts. Q: Your bio states that you, work as an innovation consultant to Fortune 500 companies. What types of situations and problems do you typically help these companies solve? Gregg: All kinds! Most typically it’s around new product development. My bread and butter work is facilitating intensive new product ideation sessions. I’ve also worked on and facilitated projects for internal process improvement. More recently I’m getting involved in assessing an organizations innovation culture and making recommendations on how they might improve. Have any questions about Creative Problem Solving? Want to know how CPS can help you find the perfect mate? Gregg has agreed to take questions in the comments section, so fire away! Thanks again for the interview Chris. And by all means it would be great to get some specific questions and comments from your readers. I think I forgot to mention that Jack’s Notebook is a page turner. I worked hard to make it an easy and fun book to read. Great interview Chris (and great answers Gregg). I’m finding it really interesting to see how others are interpreting Jack’s Notebook and the sorts of questions that are coming out of it… I also have to give Chris 5 out of 5 stars for the great graphics as well!